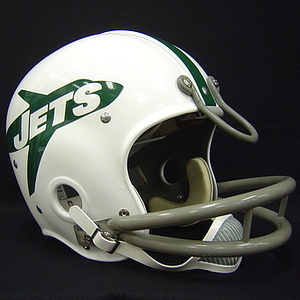 The site of the new stadium between New York’s two major airports, symbols of this speedy, modern age, influenced the selection of the new name “Jets”. It reflects the spirit of these times and the eagerness of all concerned—players, coach, and owners—to give New York another worthy team. The new team’s colors of green and white were chosen for much the same reasons, plus the fact that down through the ages green has always signified hope, freshness and high spirits.